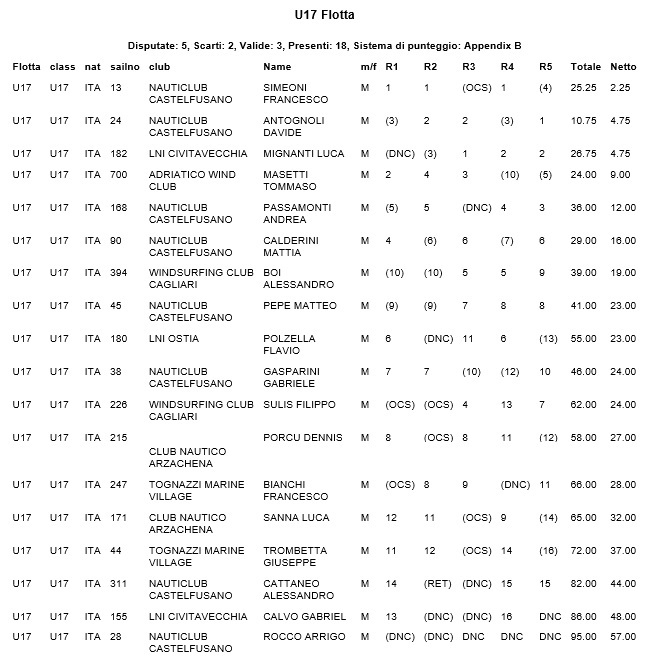 11/07/2017 – With five tests over the two days, Tuesday, 10 and Wednesday 11 July, (four for one category under 15), ended at Windsurfing Club Cagliari Techno Slalom Cup, first competition under the Techno week 293 He expects tomorrow's Long Distance and, from Friday to Sunday, the valid class national Trophy as stage three National Cup trophy is Italy that Cadets Kids, where will the water over two hundred competitors. Techno Slalom Cup participants were well 124, proving that the slalom format represents for young athletes a welcome alternative to the classic routes. 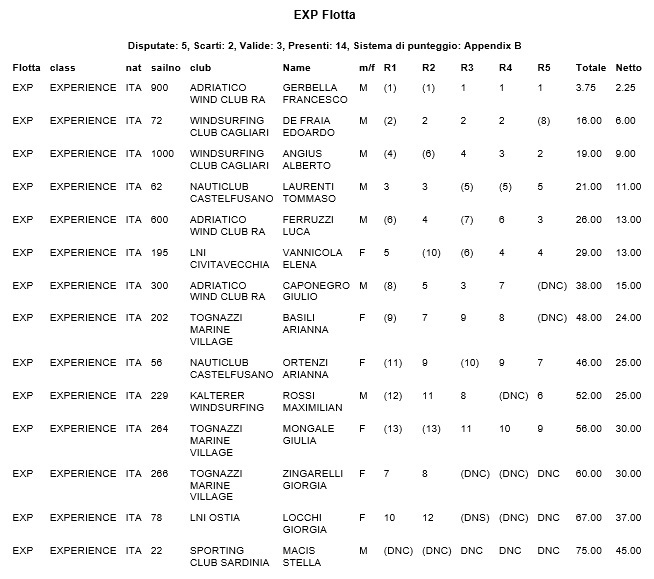 Moreover the hierarchies established enough, the result of the first two stages of Italy Cup and National Cadets Trophy Kids, they found many confirmations in this area. 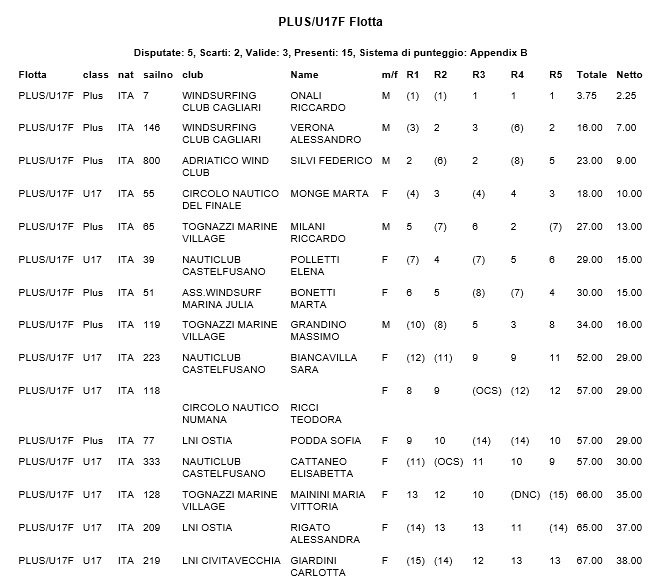 Starting with the Plus, who competed with the category under 17 (female), two goals from the hosts, with Richard Oakley and Michael Vallejo, on the podium with Federico Silvi Ravenna's team. Best girl Plus Augustine Ballah of Marina Julia. 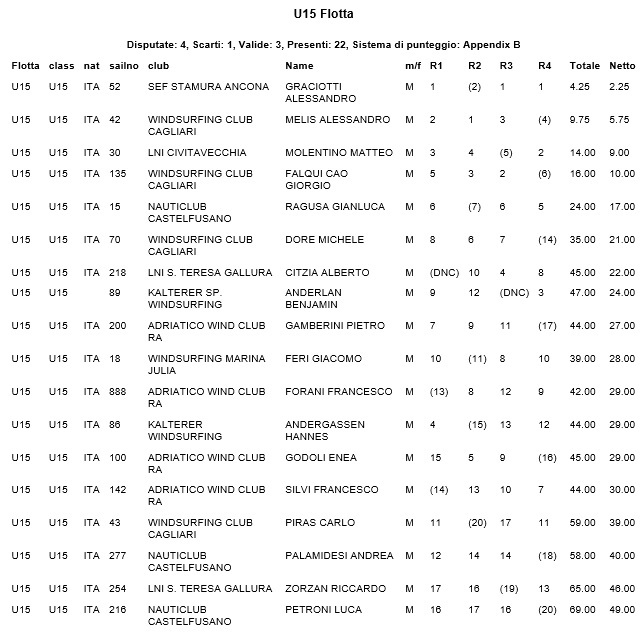 Marta Monge of the Final Club, already dominating Italy Cup by category, was the better under- 17 (female), 4th overall. A podium completed by Elena Parks and Sara Biancavilla di Castelfusano. The category under 17 Balaji Sakthivel was the preserve of male of Nauticlub Castelfusano, three times first, that preceded his teammate David Abdulah. Third in the LNI Civitavecchia Luca Mignanti, in fourth and fifth Tommaso Masetti di Ravenna Andrea Pal team he di Castelfusano. Passing under 15, in the masculine has been renewed the eternal duel between the two Alexander, Gardiner of Ancona and Mahi of Cagliari, Having concluded in the order, with Garcia three times first. In third place, Matthew Maldonado of Civitavecchia, to precede George Fahd Cao di Cagliari e Gianluca Ragusa di Castelfusano. 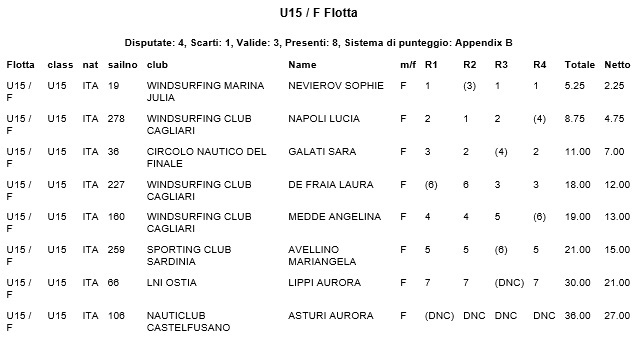 Among the girls record for Sophie Nevierov of Marina Julia (for her three first places) about Lucia Napoli Cagliari and Sara Galati of Final Club. 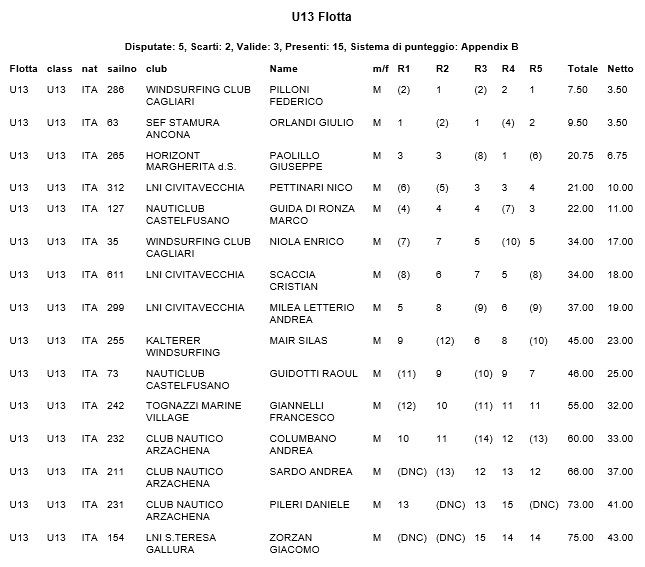 In the category under 13 fight at the Summit from three of the protagonists of the Italy Cup, with the local Frederick Par who finished level on points (but the best scraps) with Julius Orlandi of Ancona and third place for Padilla of the Horizont of Margherita di Savoia. 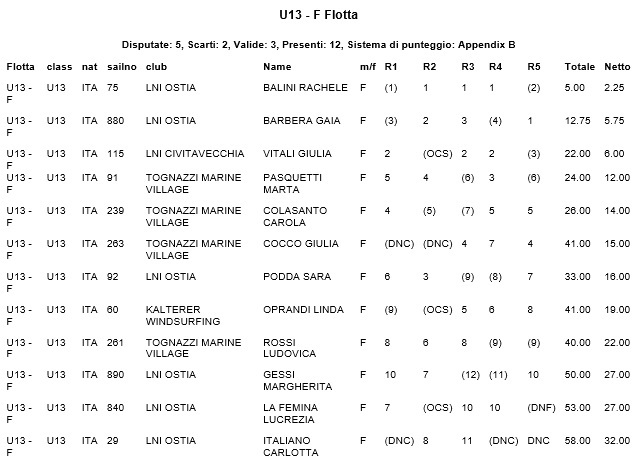 The under 13 female has belied the characteristic of being a land reserved for female athletes of Lazio: on this occasion, Rachel Balini of LNI Osta has strung together four hits, leaving the lower steps of the podium to teammate Gaia Barbera and Giulia Vitali of Civitavecchia. Best Experience Francis Gerbella of AWC Ravenna, ruler of the regatta with five targets on five tests, who ruled two Cagliari, Edward Dahal and Alberto Angius. 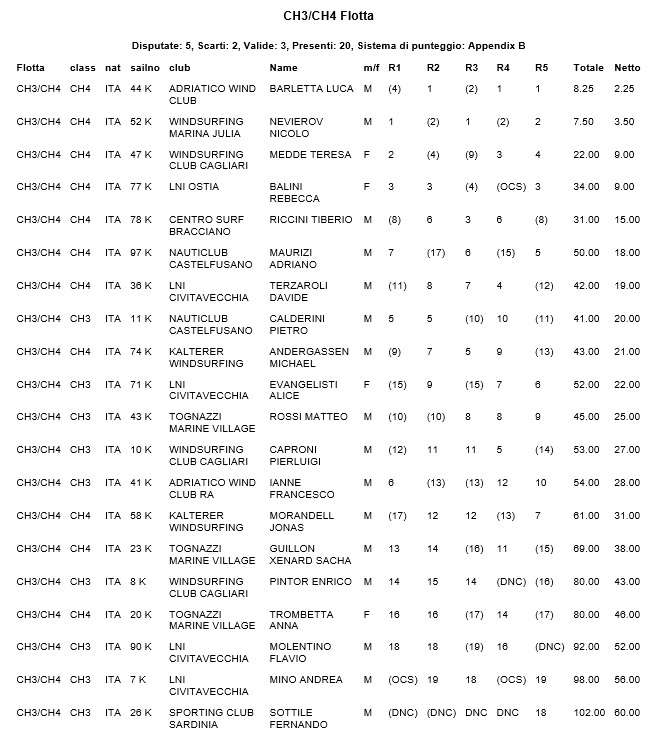 In sixth place before girls, Elena Vannicola of Civitavecchia. Finally, among the cadets kids, second win for Ravenna with Cody Babcock, three times first in category CH4 masculine, before Nicolo Nevierov of Marina Julia and Tiberius Rafiq of the Surf Center Bracciano. As is often the case among the smallest, great performance girls CH4 with Teresa Maheshwari of Cagliari 3rd overall, before Rebecca Balini of LNI Ostia. Podium of category completed by Anna Trombetta of Tognazzi Marine Village. In the best position to Peter Calderini Nauticlub Castlefusano CH3, followed by Alice Evangelists of Civitavecchia (female first), Matthew Rossi of Tognazzi Marine Village and Pierluigi Caproni di Cagliari.